In an age where the belief in love is slowly fading, Sonia and Karan’s sweet story restores our faith in the fact that true love exists. Their story dates back to college when interactions were minimal and conversations were confined to 'hellos' and 'goodbyes'. As time passed by, the prospect of marriage started to become more and more real to Sonia and Karan, who lived in different worlds, belonged to two distinct zones, and their interactions were limited to stolen gazes and subtle smiles exchanged in college hallways. They lived the clichéd “Absence makes the heart grow fonder” in reality. Only when they weren’t together did they realise how much they valued each other. That’s how they began to put in more effort in their friendship, which slowly evolved into two souls becoming one in love. 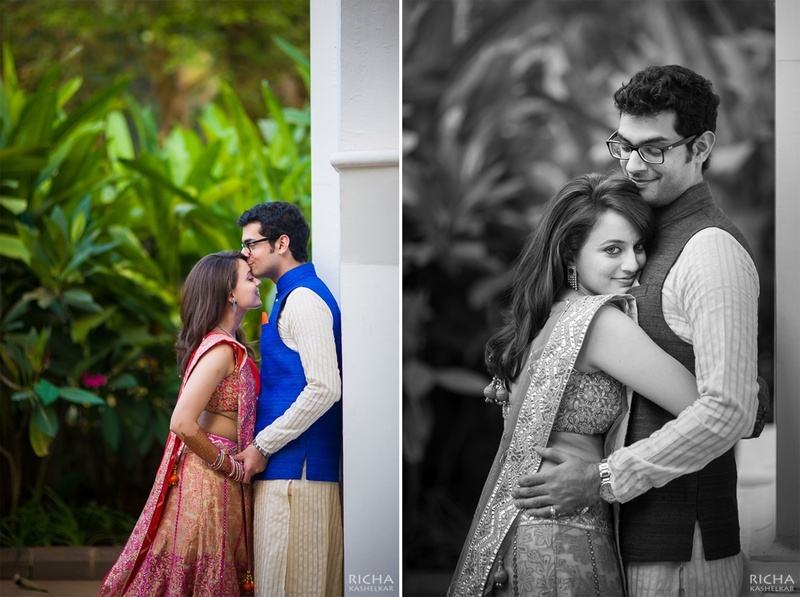 They spontaneously decided to host their wedding in the beautiful state of Goa! Even though venues in Mumbai were already booked, there was something about the extra romance in the Goa air that added to their impromptu plans. So, off they went with smiles, luggage and all! Dressed in an ethnic red paithani saree with gorgeous gold weaves, Sonia was escorted to the mandap in the arms of loved ones. The handsome groom, also carried by his friends, was dressed in a classic textured cream silk sherwani and a red brocade safa. An outdoor vedi mandap decorated with fresh green ferns and flowers in hues of purple and orange hosted the traditional Maharashtrian marriage of these beautiful souls. Topiaries of flowers were hung across the seating area, and lush green trees were adorned with the two-toned tassels that looked just perfect. According to Sonia, Karan was one of the most excited grooms she has ever seen! He kept leaning in and telling her “I’m so excited and I’m so happy”! Of course when people are 100% happy on their wedding day, but when you see some one who’s 200% happy, it makes it even more special! We absolutely love how this beautiful bride kept it minimal and classy – whether it was her makeup or jewellery. She believed that less is more and restricted her adornments to a traditional gold necklace, matching maangtikka and earrings. Karan loved every moment of his wedding and kept saying, “I am loving every second! I have the perfect woman in the perfect setting with friends and family around who love the two of us.” All in all, the whole experience made Karan feel nothing but blessed. Once things were made official, celebrations continued with the reception ceremony. Sonia donned a gorgeous ombre pink and orange lehenga-choli that was intricately embellished with silver sequins and crystals. She wore a stunning diamond-studded jewellery set and looked like a modern-day Indian princess! Karan kept it classy, as always, in his carbon black tux paired with a bow-tie. Champagne was popped, and friends and family toasted as this beautiful couple embarked on a new journey together! The wedding was truly star-studded as famous personalities like Shahrukh Khan and Hrithik Roshan came to congratulate and dance with this beautiful couple. Even with all the glitz and glamour in this wedding, the couple did not fail to include the meaningful, fun bits like the Naak-Khichai ceremony! All we can say is that this wedding celebration had us wishing we were a part of it! A union that was filled with love, joy and all things elegant – right from the décor to the jewellery!